Watch Scientist Joe as he makes the Massive Expanding Soap Experiment here! Place the bar of soap in the bowl, and microwave it on high power for two minutes. Wait 2 minutes for the bowl and foam to cool. Ivory soap has lots of little air bubbles in it. 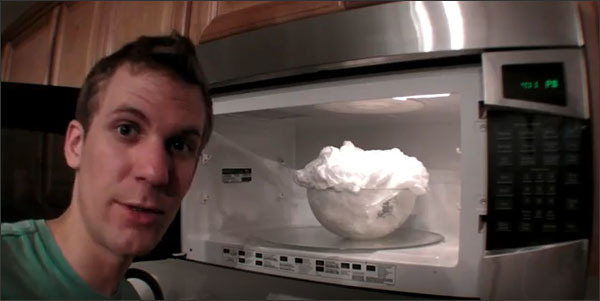 As the air bubbles are heated in the microwave, they get bigger. The soap is a solid, so once it expands, it stays expanded (although it does shrink a little as it cools). The soap still works as soap, so you can use it by breaking off pieces to wash your hands. The whole bowl of foam can be used to make a bubble bath, or you can create some Clean Clay with the soap, 1 cup of hot water, and a new roll of toilet paper. Put the expanded soap in a container large enough to hold it all, then pour the hot water over it. Stir and squish the soap until most of the lumps are gone. Unroll the toilet paper a few feet at a time, and add it to the soapy water. Squish and mix them as you add more paper. For thick toilet paper, you will only need half a roll. For thin paper, use the whole roll. Squish and mix the Clean Clay, breaking up lumps, until it is the texture of clay. Then sculpt it and experiment however you want! After you’re finished, you can clean your hands just by washing them in the sink. You already have soap on your hands!